The primary GIC line COMI derived from an adult GB has been previously described [10–13] (Fig. 1a-c). Its authentication was performed by determining the proliferation rate, the expression of DDR, stem, PI3K/Akt pathway genes as well as the IDH1, TP53, H3F3A, PDGFRA, CDKN2A and EGFR status as previously described [10–13]. COMI GICs have wild type TP53 sequence but they express the TP53 RNA at low levels . COMI GICs initiate orthotopic glioma development with > 95% efficiency when injected i.c. 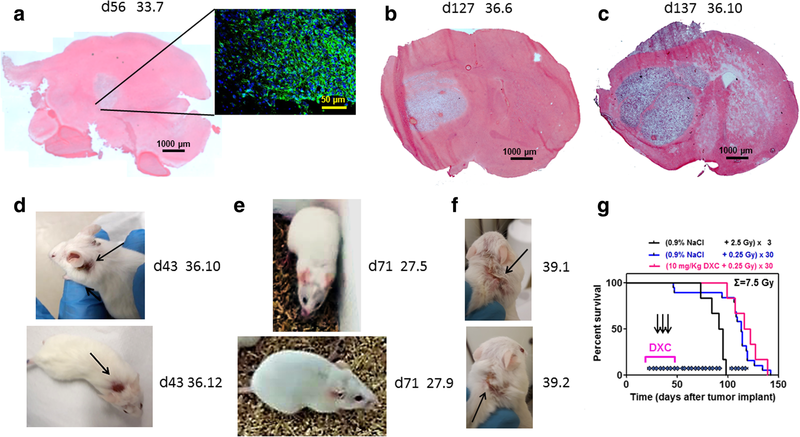 into immunodeficient NOD-SCID mice [10–13] (Fig. 1a-c). To this aim, 4-5 weeks old NOD/SCID mice were anesthetized with isoflurane. Thereafter, the animals were positioned into a stereotaxic frame (David Kopf instruments) and a hole was made, using a 21-gauge needle, 2.5 mm lateral and 1 mm anterior from the intersection of the coronal and sagittal sutures (Bregma). 1.3 x 105 GIC were injected at a depth of 3 mm in correspondence of the left corpus striatum and the skin closed using metal staples (Martin GMBH, Tuttingen, Germany). In order to avoid significant subpopulation selection during prolonged cell culture, GIC samples frozen after no more than 30 days of culture were used for orthotopic tumor development.